Heat the oil in the same pan. Briefly sauté the onion and chilli pepper, add the tomatoes and cook for approx. 5 mins. Pour in the wine, mix in the thyme, season with salt. Peel the potatoes while still hot. Pass the hot potatoes through a food mill into a bowl, allow to cool slightly. Beat the egg. Mix the flour, cheese, egg, salt and nutmeg with the mashed potato, adding a little flour if necessary. The mixture should still be moist but no longer stick to your hands. 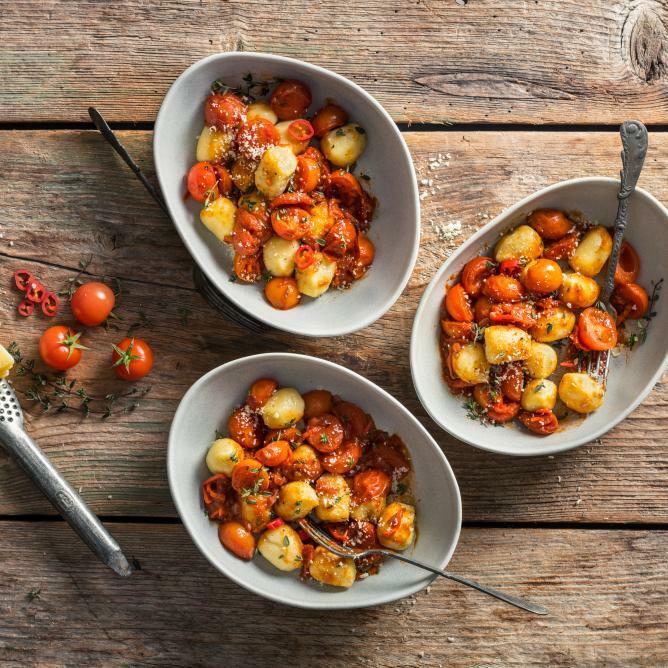 To shape On a lightly floured surface, shape the gnocchi mixture into 4 rolls (each approx. 1.25 cm in diameter). Cut the rolls into pieces approx. 2 cm long. Cook the gnocchi in 4 batches in simmering salted water for approx. 5 mins. per batch. Remove with a slotted spoon, drain, cover and keep warm. Reheat the sauce and serve with the gnocchi. Serve with grated or shaved parmesan.